Index to Volume Seven - The People - Dock Family Trees - Engineers, Artisans & Doers . 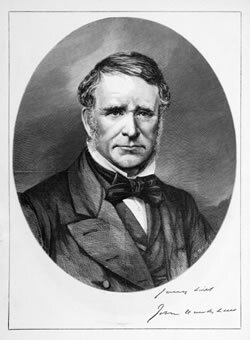 . .
Sir John Hawkshaw (1811-1891) was an English civil engineer. 1811 April 9th. Born in Leeds, Yorkshire and was educated at Leeds Grammar School. Before he was 21 he had been engaged for six or seven years in railway engineering and the construction of roads in his native county, and in the year of his majority he obtained an appointment as engineer to the Bolivar Mining Association in Venezuela. But the climate there was more than his health could stand, and in 1834 he was obliged to return to England. He obtained employment under Jesse Hartley at the Liverpool Docks, and subsequently was made engineer in charge of the railway and navigation works of the Manchester, Bolton and Bury Canal Co. 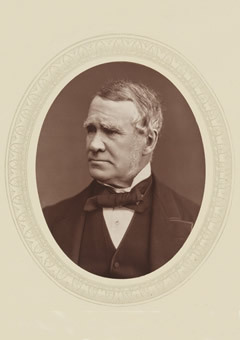 In 1850 he removed to London and began to practice as a consulting engineer, at first alone, but subsequently in partnership with Harrison Hayter. In that capacity his work was of an extremely varied nature, embracing almost every branch of engineering. He retained his connection with the Lancashire and Yorkshire Company until his retirement from professional work in 1888, and was consulted on all the important engineering points that affected it in that long period. In London he was responsible for the Charing Cross and Cannon Street railways, together with the two bridges which carried them over the Thames; he was engineer of the East London railway, which passes under the Thames through Sir Marc Brunel's well-known tunnel; and jointly with Sir John Wolfe Barry he constructed the section of the Underground railway which completed the inner circle between the Aldgate and Mansion House stations. In addition, many railway works claimed his attention in all parts of the world - Germany, Russia, India, Mauritius, etc. One noteworthy point in his railway practice was his advocacy, in opposition to Robert Stephenson, of steeper gradients than had previously been thought desirable or possible, and so far back as 1838 he expressed decided disapproval of the maintenance of the broad gauge on the Great Western, because of the troubles he foresaw it would lead to in connection with future railway extension, and because he objected in general to breaks of gauge in the lines of a country. The construction of canals was another branch of engineering in which he was actively engaged. In 1862 he became engineer of the Amsterdam ship-canal, and in the succeeding year he may fairly be said to have been the saviour of the Suez Canal. About that time the scheme was in very bad odour, and the Khedive determined to get the opinion of an English engineer as to its practicability, having made up his mind to stop the works if that opinion was unfavourable. Hawkshaw was chosen to make the inquiry, and it was because his report was entirely favourable that Ferdinand de Lesseps was able to say at the opening ceremony that to him he owed the canal. As a member of the International Congress which considered the construction of an inter-ocean canal across central America, he thought best of the Nicaragua route, and privately he regarded the Panama scheme as impracticable at a reasonable cost, although publicly he expressed no opinion on the matter and left the Congress without voting. Sir John Hawkshaw also had a wide experience in constructing harbours (e.g. Holyhead) and docks (e.g. Penarth, the Albert Dock at Hull, and South Dock (formerly the City Canal) of the West India Docks in London), in river-engineering, in drainage and sewerage, in water-supply, etc. He was engineer, with Sir James Brunlees, of the original Channel Tunnel Co from 1872, but many years previously he had investigated for himself the question of a tunnel under the Strait of Dover from an engineering point of view, and had come to a belief in its feasibility, so far as that could be determined from borings and surveys. Subsequently, however, he became convinced that the tunnel would not be to the advantage of Great Britain, and thereafter would have nothing to do with the project. He was also consulting engineer to the Severn Tunnel, which, from its magnitude and the difficulties encountered in its construction, was one of the most notable engineering undertakings of the 19th century. Following the inundation of the tunnel working in 1879, he employed Thomas A. Walker as lead contractor to complete the work. He also designed the famous Puerto Madero, the port of Buenos Aires, collaborating with Thomas A. Walker and James Murray Dobson. The works started its construction in 1885 and was finished in 1898. 1836 John Hawkshaw of Manchester / Liverpool, a Civil Engineer, became a member of the Institution of Civil Engineers. 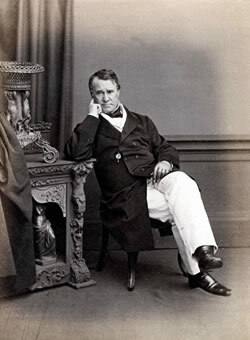 He was elected a Fellow of the Royal Society in June 1855. He served as president of the Institution of Civil Engineers between December 1861 and December 1863. He was knighted in 1873.